Fort William (Scottish Gaelic: An Gearasdan [ən ˈkʲɛɾəs̪t̪ən]; "The Garrison") is a town in the Scottish Highlands, located on the eastern shore of Loch Linnhe. 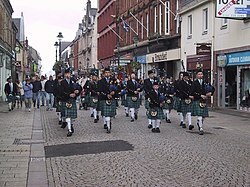 As of the 2011 Census, Fort William had a population of 10,459, making it the second largest settlement in the Highland council area, and the largest town—only the city of Inverness has a larger population. Fort William is a major tourist centre, with Glen Coe just to the south, Aonach Mòr to the east and Glenfinnan to the west, on the Road to the Isles. It is a centre for hillwalking and climbing due to its proximity to Ben Nevis and many other Munro mountains. It is also known for its nearby downhill mountain bike track. It is the start/end of both the West Highland Way (Milngavie—Fort William) and the Great Glen Way (a walk/cycle way Fort William–Inverness). The earliest recorded settlement on the site is a Cromwellian wooden fort built in 1654 as a base for English troops to "pacify" Clan Cameron after the Wars of the Three Kingdoms. The post-Glorious Revolution fort was named Fort William after William of Orange, who ordered that it be built to control the Highland clans. The settlement that grew around it was called Maryburgh, after his wife Mary II of England. This settlement was later renamed Gordonsburgh, and then Duncansburgh before being renamed Fort William, this time after Prince William, Duke of Cumberland; known to some Scots as "Butcher Cumberland". 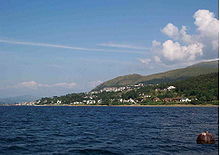 Given these origins, there have been various suggestions over the years to rename the town (for example, to Invernevis). The origin of the Gaelic name for Fort William, An Gearasdan, is not recorded but could be a loanword from the English garrison, having entered common usage some time after the royal garrison was established, during the reign of William of Orange or perhaps after the earlier Cromwellian fort, or from the ultimately French-derived word "garrison", as at the earlier garrison at Inverlochy by the Scoto-Norman Clan Comyn. Historically, this area of Lochaber was strongly Clan Cameron country, and there were a number of mainly Cameron settlements in the area (such as Blarmacfoldach). Before the building of the fort, Inverlochy was the main settlement in the area and was also where two battles took place—the first Battle of Inverlochy in 1431 and the second Battle of Inverlochy in 1645. 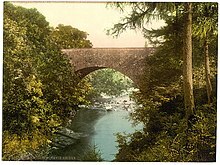 "Nevis Bridge, Fort William, Scotland", ca. 1890 -1900. The town grew in size as a settlement when the fort was constructed to control the population after Oliver Cromwell's invasion during the Wars of the Three Kingdoms, and then to suppress the Jacobite uprisings of the 18th century. In the Jacobite rising of 1745 known as the Forty-Five, Fort William was besieged for two weeks by the Jacobites, from 20 March to 3 April 1746. However, although the Jacobites had captured both of the other forts in the chain of three Great Glen fortifications (Fort Augustus and the original Fort George), they failed to take Fort William. During the Second World War, Fort William was the home of HMS St Christopher, which was a training base for Royal Navy Coastal Forces. More on the history of the town and the region can be found in the West Highland Museum on the High Street. Fort William is the northern end of the West Highland Way, a long distance route which runs 95 miles (153 km) through the Scottish Highlands to Milngavie, on the outskirts of Glasgow, and the start/end point of the Great Glen Way, which runs between Fort William and Inverness. On 2 June 2006, a fire destroyed McTavish's Restaurant in Fort William High Street along with the two shops which were part of the building. The restaurant had been open since the 1970s and prior to that the building had been Fraser's Cafe since the 1920s. Development work began in 2012 on new hotel accommodation and street-level shops, and these opened in 2014. A "Waterfront" development was proposed by the Council, but there was no overwhelming support for this in the town. The development would have included a hotel, some shops and some housing, but it was stated early in 2008 that it was unlikely to be completed before 2020. It was announced in April 2010 that the project had been abandoned. Originally based on the still-extant village of Inverlochy, the town lies at the southern end of the Great Glen, Fort William lies near the head of Loch Linnhe, one of Scotland's longest sea lochs, beside the mouth of the rivers Nevis and Lochy. They join in the intertidal zone and briefly become one river before discharging to the sea. The town and its suburbs are surrounded by picturesque mountains. It is also on the shore of Loch Eil. It is close to Ben Nevis, the highest mountain in the British Isles, Glen Nevis and the town of Achnaphubuil, is on the opposite shore of the loch. When the railway opened to Fort William on 7 August 1894, the station was given prime position at the south end of the town. The consequence was that the town was separated from the lochside by railway tracks until the 1970s, when the present by-pass was built, and the station was re-located to the north end. The town is centred on the High Street, which was pedestrianised in the 1990s. Off this, there are several squares: Monzie Square (named after the Cameron Campbells of Monzie, Perthshire, former landowners in the town); Station Square, where the long-since demolished railway station used to be; Gordon Square (named after the Gordons, who in the late 18th century owned land where the town now stands, when the town was named Gordonsburgh); and Cameron Square — formerly known as Town Hall Square. There is also Fraser Square, which is not so square-like, since it now opens out into Middle Street, but it still houses the Imperial Hotel. The main residential areas of the town are unseen from the High Street and from the A82 main road. Upper Achintore and the Plantation spread steeply uphill from above the high street. Inverlochy, Claggan, An-Aird, Lochyside, Caol, Banavie and Corpach outwith (i.e. outside) the town are the other main residential areas. These areas are built on much flatter land than the town. Glenfinnan, 17 miles (27 km) away, is home of the Glenfinnan Monument (Jacobite era) and the famous Glenfinnan Viaduct (as seen on a Bank Of Scotland £10 note). The viaduct has become known to millions in recent years as the "Harry Potter Bridge" after it featured in the films of the books by J.K. Rowling, specifically Harry Potter and the Chamber of Secrets. Glenfinnan has also been used in Charlotte Gray and Highlander. Just outside the town is a large aluminium plant operated by Alcan and powered by the Lochaber hydroelectric scheme, in its day the biggest tunnelling project in the world. This was formerly served by the Lochaber Narrow Gauge Railway better known locally as the Puggy Line. Fort William has an oceanic climate (Cfb) with moderate, but generally cool, temperatures and abundant precipitation. Arrival at Fort William of the overnight sleeper train from London Euston. The West Highland Line passes through Fort William. Owing to the difficult terrain in the area, the line from Glasgow, to the south, enters from the northeast. Trains from Glasgow to Mallaig, the terminus of the line, have to reverse at Fort William railway station. An overnight train, the Caledonian sleeper, has its terminus at Fort William. This service is known colloquially as 'The Deerstalker'. The stands for local buses and express coaches are on MacFarlane Way adjacent to the railway station. The Caledonian Canal connects the Scottish east coast at Inverness with the west coast at Corpach near Fort William. The ferry to Camusnagaul crosses Loch Linnhe, connecting the A82 to A861. Fort William and the surrounding area is a year round destination for climbers from all over the world. The draw of nearby Ben Nevis is irresistible to anyone, from first time climbers to professional winter climbers. When the weather halts any attempt for outdoor climbing, Three Wise Monkeys Climbing, the climbing wall in the centre of town, offers sanctuary for anyone of any age or experience. Just outside the town, parallel to the Nevis Range Gondola, there is a large downhill mountain bike track which attracts thousands of visitors every year, including international competitors and fans. Each year since 2001, Fort William has hosted a round of UCI Mountain Bike World Cup, and in 2007 it hosted the UCI Mountain Bike & Trials World Championships ('The Worlds'). Also a trials competition is held, at the various courses at the bottom. Fort William has also hosted the World Endurance Mountain Bike Organisation (WEMBO) solo 24 hour championship, in 2014 and again in 2018. The event consists of riders racing for a full 24 hours and is won by the rider completing the greater number of laps. Fort William is the home of the Scottish Six Day Motorcycle Trial (SSDT), held annually in the first full week of May. It attracts many competitors from all across the globe and in 2011 the event celebrated its centenary year. Fort William has two major shinty teams, Fort William Shinty Club and Kilmallie Shinty Club. It also has a football team, Fort William F.C., that competes in the Scottish Highland Football League and plays home games at Claggan Park. There is also a cricket club at Fort William that participates in the North of Scotland Cricket Association league (NoSCA). In addition, the town is home to Lochaber Rugby Club and to the Lochaber Yacht Club, a Community Amateur Sports Club that was founded in 1954. The town also has one golf club, called Fort William Golf Club, which has eighteen holes and is open year round. It also hosts weekly competitions. Movies filmed in or near Fort William include Being Human, Braveheart, Highlander, Restless Natives, Harry Potter and Rob Roy. The TV series Rockface was filmed mainly around Fort William and some scenes of Monarch of the Glen were filmed around Lochaber, although mostly near Newtonmore. Local Hero shot the internal Houston scenes in Fort William. In a celebration of mountains and the culture that surrounds them, and in recognition of the importance of climbing and walking tourism to the town, the Fort William Mountain Festival is held there each year. For a number of years,[when?] this volunteer-led festival has concentrated mostly around film but, starting in the Year of Highland Culture – Highland 2007, its scope was widened, and it dropped the word 'film' from its title. Highland Tribes music and cultural festival is held in Fort William in July of each year. The festival focuses on new and diverse Scottish music, including many local acoustic acts and mainstream bands from all over the country. Lochaber High School is the local high school and serves a large catchment area which includes the surrounding villages. The town itself is served by three primary schools, one of which is a Catholic school. Charles Kennedy – Former leader of the Liberal Democrat party and former Liberal Democrat Member of Parliament for Ross, Skye and Lochaber. Although born in Inverness, was brought up and educated in Fort William. Danny Alexander – The former Chief Secretary to the Treasury and Liberal Democrat Member of Parliament for Inverness, Nairn, Badenoch and Strathspey. Brought up in Invergarry, a small village near Fort William. Justin Ryan – interior decorator and television presenter, although born in Glasgow, was brought up in Fort William. Allan MacDonald – Roman Catholic priest, Scottish Gaelic scholar, and pastor in South Uist and Eriskay, was born and brought up in Fort William. ^ "Highland profile - key facts and figures". ^ "Gàidhlig (Scottish Gaelic) Local Studies" (PDF). Population figures. Linguæ Celticæ. September 2006. Retrieved April 7, 2012. ^ Old Fort William And Cromwellian Barracks Visit Fort William (Tourist information site). ^ Lochaber History & Culture Visit Fort William, Scotland (Tourist information). ^ "Faddoch (Ross), An Fhàdaich" (PDF). Archived from the original (PDF) on 2005-01-23. Retrieved 2009-07-30. ^ Historic Environment Scotland. "Battle of Inverlochy I (BTL34)". Retrieved 11 April 2019. ^ Historic Environment Scotland. "Battle of Inverlochy II (BTL24)". Retrieved 11 April 2019. ^ "Lochaber News". Lochaber News. Archived from the original on 2007-12-15. Retrieved 2009-07-30. ^ "Lochaber News 12 January 2008". Lochaber-news.co.uk. 2008-01-12. Archived from the original on 2009-02-08. Retrieved 2009-07-30. ^ "Bank of Scotland £10 Bridges". Scotbanks.org.uk. Archived from the original on 2008-08-28. Retrieved 2016-11-11. ^ "Climate data for Fort William". Weather 2 Travel. Retrieved 2012-04-07. ^ "West Highland Railway". Railscot. Retrieved 2009-07-30. ^ Quine, Adrian (1 June 2014). "The 1980s time-warp of the London-Scotland sleeper train". BBC News. Retrieved 6 April 2016. ^ "Bus Station (Stances 1/2) Bus Stand, MacFarlane Way". www.getmyride.uk. Retrieved 16 February 2017. ^ Calder, Simon (6 May 2011). "The Caledonian Canal". The Independent. Retrieved 6 April 2016. ^ "Camusnagaul Ferry". www.lochabertransport.org.uk. Retrieved 5 April 2019. ^ Fort William Mountain Festival. Retrieved from http://www.mountainfilmfestival.co.uk/. ^ "Highland Tribes Music Festival 2017 – Fort William music and cultural festival". Archived from the original on 2017-01-18. Retrieved 2018-12-06. MacCulloch, Donald B. (1971). Romantic Lochaber. Chambers. ISBN 978-0-550-50347-3. "Fort William, a police burgh of Inverness-shire, Scotland" . Encyclopædia Britannica (11th ed.). 1911. Wikimedia Commons has media related to Fort William, Scotland. Wikivoyage has a travel guide for Fort William.